OK, so maybe I took more than two days off, however, a week is more than enough. I sometimes get a little funky around Mother’s Day, but it was a beautiful day and it looks to be a productive week. Hope your Monday has a fruitful beginning as this card suggests it might! Meaning: The initial attraction and exploration of potential. The beginning of a possible relationship or friendship and the precursor to an interchange of polaric energies. Opposition and attraction in life. Reading Points: The first shared spark of attraction between two human beings can appear simple and uncomplicated on the surface, but the underlying psychological chemistry and the subtle interplay that ignites that magical first exchange is usually complex and eclectic. As human beings, we absorb millions of subliminal signals and messages from those around us, and we unconsciously process these stimuli and react to them every second of every day. We subconsciously absorb body language, scent, and nonverbal communication and react to them emotionally with impulses and decision-making instincts developed over millennia. Taking an instantaneous dislike to someone is governed by the same set of prehistory sensory drives developed by humans when we roamed freely across the African savannah; “love at first sight” is as valid today as it was then. Our perceptions and signals are shared, acknowledged and reciprocated, breaking through the protective barriers and forming the initial polaric bond that is the foundation of deep and lasting attraction. Description: Two anthropomorphic figures, a horse-headed female and a stag-headed male, face each other with one hand raised and one lowered. Their arms form a diamond shape, and in the center is an enflamed heart. 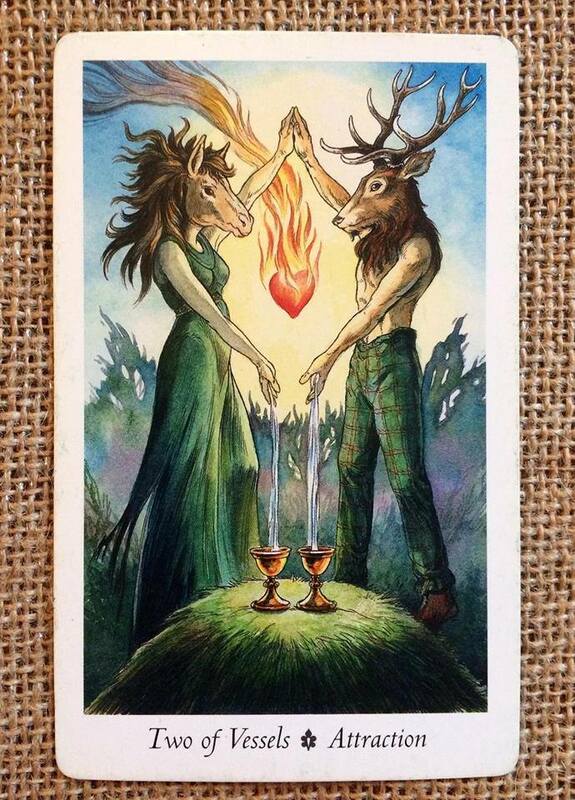 From their two lowered hands flow streams of water, falling into two cups that sit upon a low hill beneath them.